Hold us, we’re not ready. An alleged piece of poster art—presumably created for merchandising purposes—has hit the web, giving us our potential first look at some intriguing imagery from the film. There’s new crimson stormtroopers, a Y-Wing, what appears to be the Knights of Ren, Naomi Ackie’s new character, and even Kylo Ren wearing a repaired version of the mask he shattered in The Last Jedi. 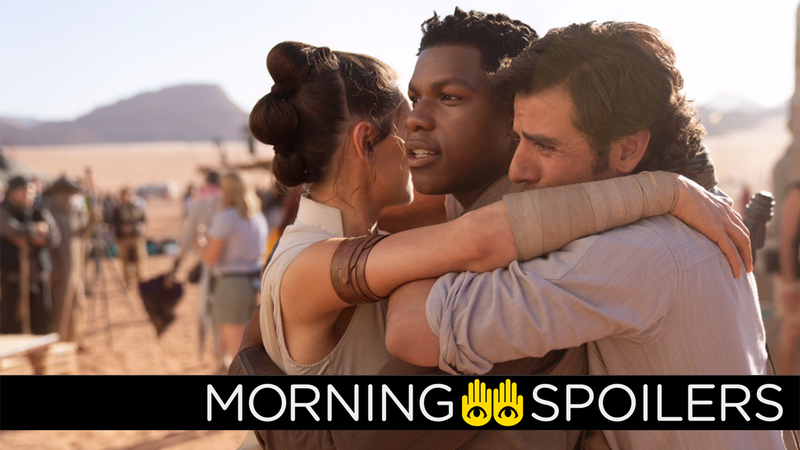 The costumes worn by Finn, Rey, and Poe seemingly match up with what little we got to see of the characters in a photo released by J.J. Abrams to mark the end of production last month. Mark Hamill himself has cast doubt on the veracity of the poster, but, given Hamill’s penchant for twitter trickery and the fact that Lucasfilm previously declared that the merchandise art for Solo: A Star Wars Story that leaked ahead of time was unofficial (up until the moment it started appearing on toy boxes), it’s hard to say that this is necessarily a definitive debunk or obfuscation. So who can say? Someone at Lucasfilm in like, two weeks at the Star Wars Celebration Episode IX panel, probably. In potentially related news, Keri Russell revealed her mysterious Star Wars character has “the coolest costume” on a recent episode of The Late Show with Stephen Colbert. Could such a cool costume be that helmeted individual on this poster? Ok, we’re exhausted now. According to THR, Leigh Janiak is now attached to direct all three planned Fear Street movies. The outlet also reports Ashley Zukerman, Fred Hechinger, Julia Rehwald and Jeremy Ford have joined the cast in undisclosed roles. Deadline reports a film adaptation of Chuck Brown, David F. Walker, and Sanford Greene’s comic book series about a family in the 1920's fighting supernatural bigots in New York City is now in development at Legendary. Deadline reports Sonoya Mizuno has secured the lead role in Wes Ball’s upcoming adaptation of David Petersen’s Mouse Guard for 20th Century Fox. Meanwhile, That Hashtag Show has word Peter Dinklage is Warner Bros. “top choice” to play Terrance, the antagonist of Tim Story’s live-action/animation Tom & Jerry movie. Rosario Dawson is now confirmed to appear in Kevin Smith’s Jay & Silent Bob Reboot, which recently wrapped filming after a 21-day shoot. Newly leaked set photos from Morbius give us our first looks at Jared Leto and Matt Smith. Nimue, the Blood Queen, asks Hellboy to be her king in the latest clip. Coming Soon also has four new photos of David Harbour as the titular demon-bro. The Pale Lady is the latest Scary Stories entity to enjoy her own poster. Church, the undead cat, takes front and center on Pet Sematary’s exclusive Dolby Cinema’s poster. Buzz consults his “inner voice” in a new international trailer for Toy Story 4. First Showing also has a new poster spotlighting Forky’s attempted escape. A new trailer for The Angry Birds Movie 2 makes several allusions to 1998's Armageddon. Meanwhile, the latest featurette for Avengers: Endgame hypes the “extra verticality” of IMAX cameras, but reveals basically nothing new about the actual movie. Jared Padalecki and Jensen Ackles shared their own respective wrap photos for Supernatural’s fourteenth season. Just one more to go! According to TV Line, the back half of Siren’s second season premieres July 11 at 8 p.m. on Freeform. A new poster from TV Guide encourages you to “face your demons” when The 100 returns for its sixth season April 30. Bloody-Disgusting also has new photos from The Walking Dead’s season nine finale, “The Storm.” More at the link. Finally, Betty goes bananas, just like the rest of Riverdale, when Riverdale returns April 17.